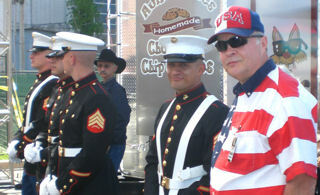 David Bancroft with Marine Honor Guard at the Salute to Our Troops' celebration When I learned about the Salute to Our Troops' celebration at the Rodeo in Houston, Texas (my hometown) on March 18, 2009 . . . I immediately changed my plans to attend it. And it includes doing so in person whenever possible! Not only did I want to be able to extend my thanks to the troops who would be there . . . it gave me the opportunity to finally meet Keni Thomas, who with his Cornbread band, was the headliner of the outdoor show that occurred before the rodeo. 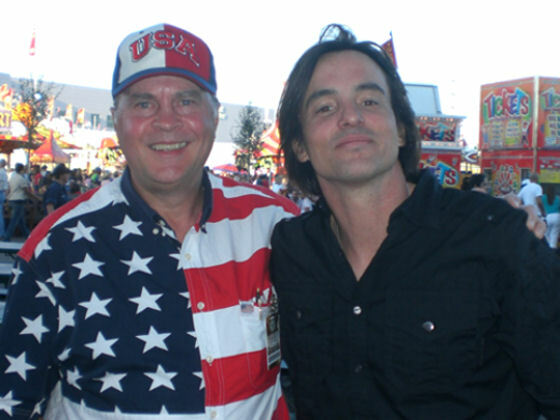 Keni Thomas, a rising country artist with several top hits, is one of those stars, who is always there for the troops wherever they may be serving. 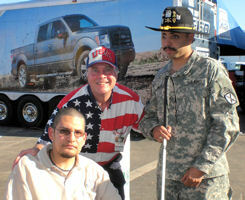 He is also a decorated combat veteran of the elite 75th Ranger Rgt special operations unit . . . receiving the bronze star for valor. Keni Thomas; Keni's fellow TTFR artists, Chad Van Rys and Cliff Hudson; and, Nash3. Nor did Keni and his fellow performers disappoint either . 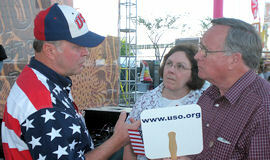 . . all doing so for free, as they were there to honor the troops in song and meeting with them afterwards. Nash3 (Bill, Kim, and Jimmy Nash) were the first to perform, which included singing “In God We Still Trust” . . . and was a major hit for Diamond Rio. 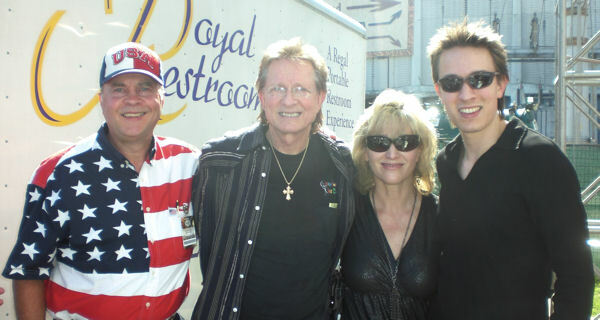 Upon meeting with them, I learned that Bill and Kim Nash had written this great song. “I met my wife while serving in a detachment for Central Naval Command in London. She was there after graduating from Vanderbilt for an internship and had just arrived a few days before . . . About five minutes after I met her I knew I was finished and later promised her that if she would put up with me as an Enlisted Infantry Marine that I'd go anywhere she wanted me to. I proposed to Ashley before I left on my last deployment to Ar Ramadi, Iraq. Of course in Iraq, with the pace we had to keep, a standard guitar was out of the question for me, but around 2 1/2 months into my deployment my soon to be father-in-law saw an article about a Marine who had found a way to get bagpipes to Iraq and decided that if that Marine could have bagpipes then his future son-in-law could have a guitar. He bought and shipped me a Martin backpacking guitar. I didn't know about it until the package arrived after one of our trips outside wire and when I saw what it was I was almost scared to open it. I had forgotten how much I longed to play and write and exactly how much emotion had built up while I'd been in Iraq. and "Send My Love" was the only way I really knew how to tell her and to make sense of everything I was feeling. “When I look back at my life, I can honestly say that there isn't one thing that I'd change. I have seen many things and experienced many experiences, but all those have helped shape who I am today. I am proud of my time in The United States Marine Corps and even more proud of the Marines I've worked for, beside, and those that fought like hell while in my charge . . . If nothing else, I hope that my story offers those in similar situations a little hope and shows that there are happy endings out there . . . I'm living proof of that." 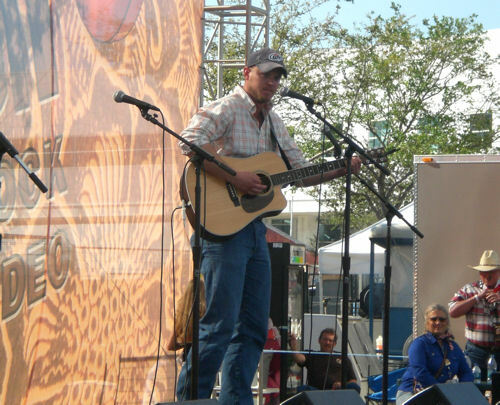 Chad, like Cliff, used his musical talent to entertain his fellow Marines while on active duty. “I have many reasons as to why I joined the Marines, and if I had to, I would do it all over again. If the music I played while we were out in the sand made somebody else smile or laugh or go somewhere else even if only in their mind...then...I am satisfied. For me, the music was an escape and hopefully when I played somebody else got to escape too . . . It almost felt like I was back home at the lake with some friends, just relaxing by a campfire. It was therapeutic. I wrote most of my songs either in the barracks or overseas and I think that they are all fairly self-explanatory. There are only a few songs that are not true events, moments, memories or dreams." Then shortly before Keni Thomas and Cornbread performed, Wayne Newton came on stage. He didn't sing this day, but honored the troops with words of praise and encouragement that would have made Bob Hope proud. 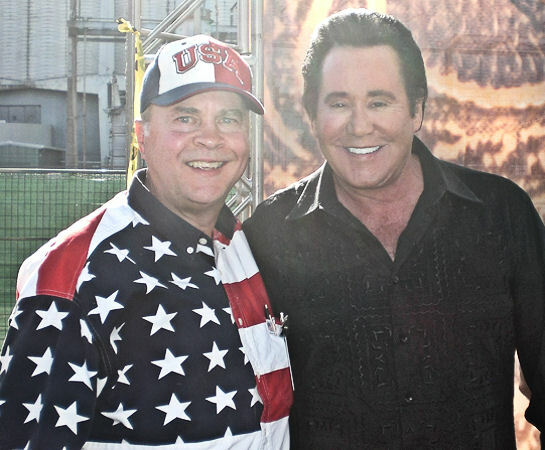 Wayne Newton was visiting troops in nearby bases in his role with the USO, which was also represented by its CEO and President, Sloan Gibson, at the Salute To The Troops' celebration. 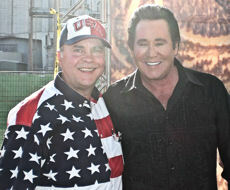 It was also an honor being able to meet with Wayne Newton again. 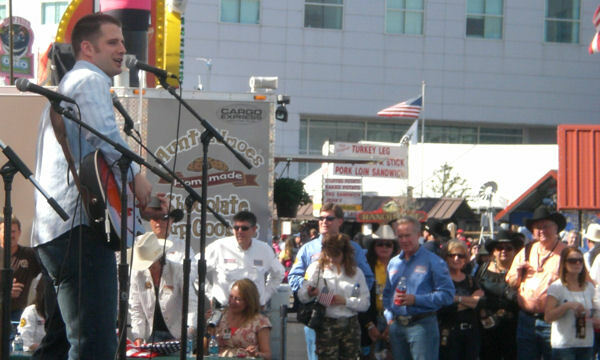 I first met him in Las Vegas two years ago, where I gave him with a signed copy of my poem, Danke Wayne Newton. 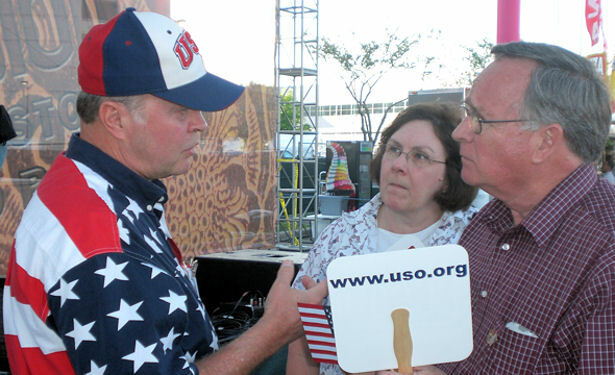 Wayne is also honored at USA Patriotism! 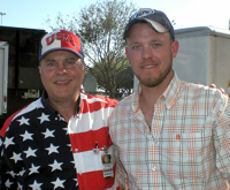 as a Great American Patriot and in the Stars There For The Troops. I believe Newton is second only to Bob Hope in time spent in unconditional support of the troops. He is much more than a great entertainer. He epitomizes one's love and pride of America . . . that is unselfishly displayed everyday! 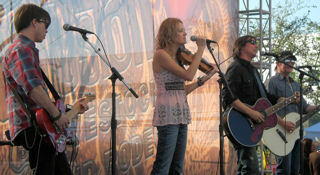 Keni Thomas (third right)) and Cornbread band performing, "Hero", that brought tears of pride too many in the crowd. Oh, I forgot to mention earlier that Keni Thomas and I actually met as I arrived. We just sort of ran into each other right before he sang the National Anthem that included a memorable fly over by two F-16s from Ellington Air Force base. We had a much longer visit after his and Cornbreads' nearly one hour performance that included several heartfelt songs from his Flags Of Our Fathers: A Soldier's Story CD, which I consider one of the best patriotic CDs. Hero and Not Me were very emotional for many in the audience with some parents of fallen heroes coming up to Keni after his performance . . . while I was speaking with him. They all expressed their thanks to him for the touching words he wrote and sang, which obviously comes from his heart. Keni even comforted one mother who was very tearful. I even had an opportunity to expresses my sincere appreciation to the parents of a son (photo right) who bravely served our beloved country and sadly made the ultimate sacrifice in 2002 while serving in Afghanistan. As a father of Marine veteran, who served in Iraq during 2003, I have a sense of their loss. I have a feeling Keni Thomas, Cliff Hudson, and Chad Van Rys might approach writing their songs the same way . . . just that they do so from personally experiencing harm's way and all that comes with it. Keni Thomas has also been recognized by USA Patriotism! in its Stars There For The Troops . . . for his tireless support of the troops . . . which he did so again in Houston. He reminds me of Wayne Newton, Gary Sinise, and other stars / celebrities who never say no when it comes to doing something for our troops, which includes being the national spokesman for the Hero Fund and the Special Operations Warrior Foundation. hometown with many of them having one or more deployments in harm's way . . . was the most gratifying time I had . . . as enough thanks and praise cannot be said to or about them. It just so happens to apply to Keni Thomas, Cliff Hudson, and Chad Van Rys, who are now veterans . 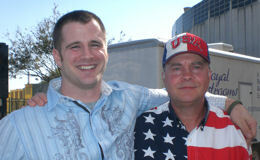 . . supporting the troops with their musical talents and other efforts. And I was fortunate to meet more of the 1,600 troops later too . . . as Salute to Our Troops (Houston, Texas) also treated them and their spouses / dates to dinner, the rodeo, and Gary Alan's concert in Reliant Stadium from several of its suites. All of it was made possible by donations and sponsorships from generous patriots. 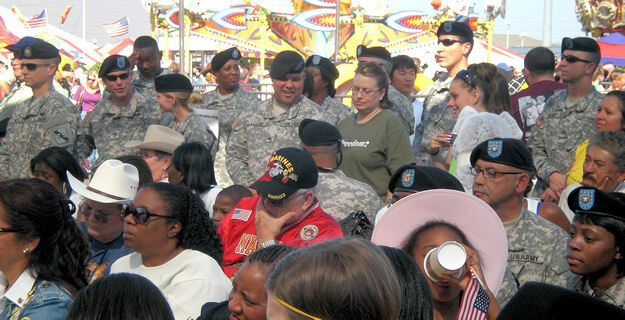 A thanks also goes to the Houston Rodeo and Livestock show in providing the venue that allowed for the Salute to Our Troops celebration. 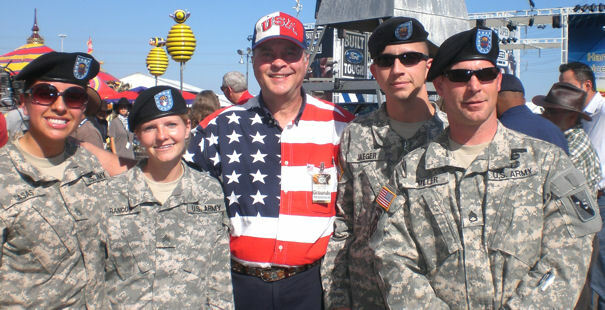 I can only imagine how many more troops will be at the third Salute To The Troops celebration in 2010, which I am looking forward to attending and doing more. Hopefully, every city will start honoring the local active troops and reservists similarly . . . and that the residents will contribute as they can . . . then come out and show their appreciation for the brave, proud ones serving our beloved USA. 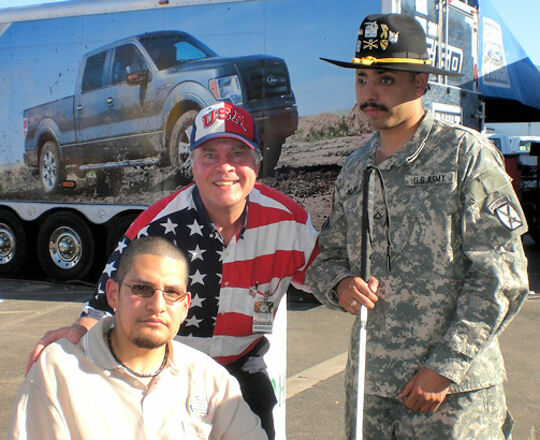 Note... You can learn more about Sean Gilfillan, co-founder To The Fallen Records and an Army Reserve Captain by watching an interview of him listed on USA Patriotism!